So long, old pals! Thanks for the miles and the memories! I have a hard time throwing away my old, worn out running shoes. The minimalist in me (Yes, Michael K. Farrell, there is an ounce of my being that hates my magazine piles, too) wants to immediately toss them in the trash when a shiny new pair enters my life. But the packrat in me has a hard time letting go of my running buddies. These foot huggers protected me from the pavement, cushioned my joints on long runs, and added spring to my speedier efforts. Clearly, we have a bond like no other. I’ve read that you should collect memories, not mementos. That advice could not be truer when it comes to sneakers—there’s no need to hang on to worn out foot gear. But how do you know, I mean really know, when it’s time to say goodbye? Most experts recommend retiring a pair when they’ve supported you through 300 to 500 miles. The wide range has to do with how they’re constructed—minimalist styles will break down faster than ultra cushiony models. Still, keeping track of the mileage on a pair can get confusing, especially if you happen to rotate a second set in for special workouts (maybe you’ve got running shoes you only wear at the track, or perhaps a pair that just gets laced up for long runs). 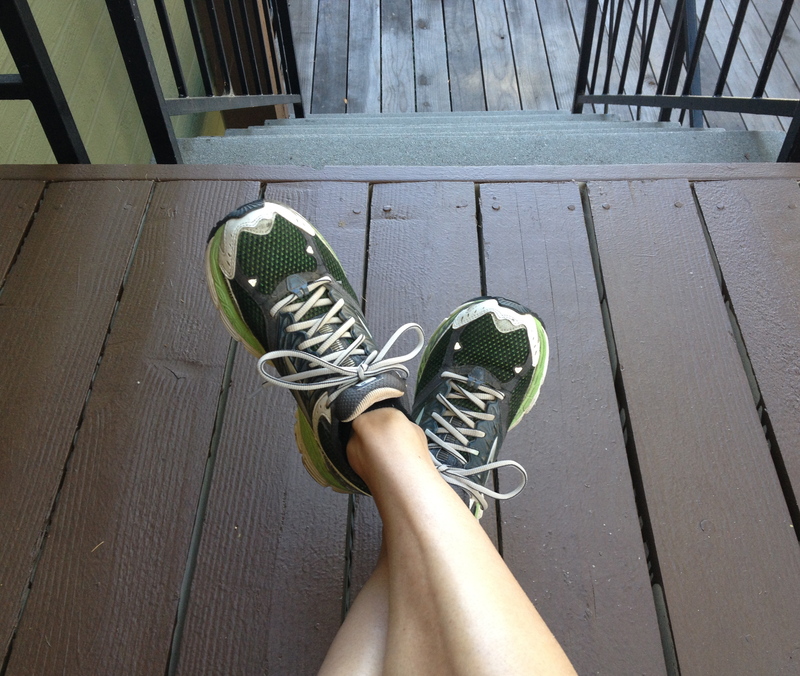 I usually decide it’s time to let them go when my legs feel flat or achy, even after short, easy runs. That’s the point when I’ll think to myself, “Oh yeah, I bought these two seasons ago,” and know for sure they’ve passed their prime. 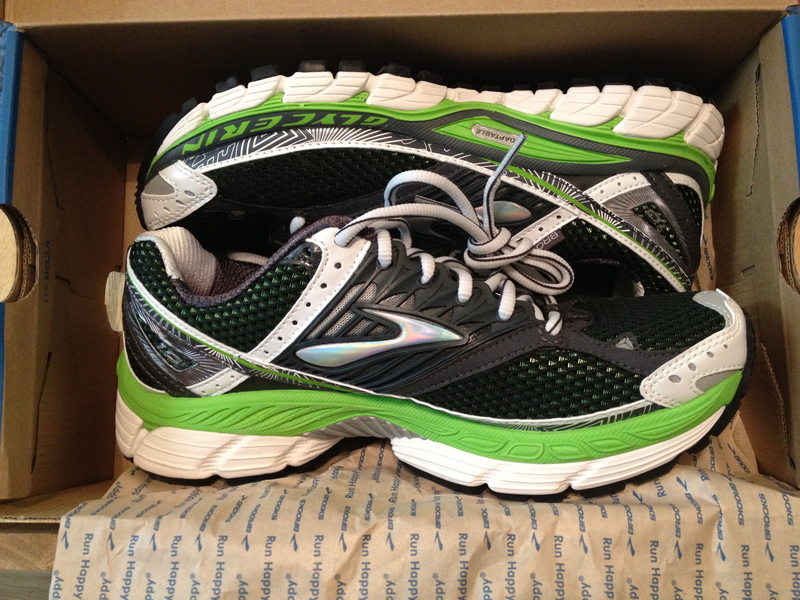 Remember when I got these Brooks Glycerin 10s? They had so much pavement potential! In the past, I’ve donated not-quite-worn-out sneaks to charities, like Shoe 4 Africa, which puts them on the feet of children to prevent the spread of diseases such as hookworm. Others have been lovingly washed, wrapped in plastic bags, and tossed into Good Will bins. But I can’t bear the thought of someone less fortunate logging a few miles in these old things—I wouldn’t wish angry joints on anyone. So this pair of Brooks will be going to the Nike store. Nike recycles all brands of used sneaks into Nike Grind, a substance used to make sports surfaces like basketball courts, turf fields, and tracks. How’s that for putting old shoes out to pasture? Is it tough for you to toss old running shoes, too? Where do yours end up? I think it’s tough to throw old shoes away – think of the memories! I donated my last pair at the Dirty GIrl Mud run (they take them even after you destroy them in mud!) but next time I’ll definitely send them to Nike! It’s such a good idea. I’m with you, Kristen! And I love when races have donation bins near the finish line!